Passover catering can take quite some time. Think of all the planning and the time you will spend in the kitchen just to bring to the table a perfect meal that the whole family will enjoy. While cooking is joyful and satisfying to some, you may not have time to put together a large meal that is befitting of the occasion. Chutzpah takes this burden off your hands by preparing the ideal meal for this special occasion. 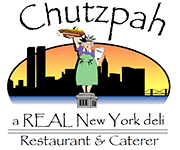 Chutzpah has a special celebratory menu that includes beef brisket made to perfection, herb-roasted chicken, matzo ball soup, chopped liver, vegetable baskets and an assortment of dessert items among other delicacies. Whatever is not on our menu – although we are very thorough – will still make it to your table as long as you arrange with us in good time. We appreciate how special Passover is when you gather with your loved ones to observe important rituals, share prayers and delicious meals. This celebration only comes once a year and it might be the only time you have with everyone at the table, so we believe it should be as special as possible. We also believe that time is of the essence and so you should spend it talking and creating more beautiful memories. By catering to this occasion, we leave you all the time you need to celebrate. Whether you need the complete Seder dinner or just a few sides to complete the meal, we got you covered. The team sets up and sits down with you to create the ideal menu that will fit the celebration and work with you all through. Northern Virginia has been counting on us to create the ideal menu for their events and here is why. While our menu includes the meals that you will enjoy during this celebration, we accept any changes that could make it even more special. We recommend that you place your orders by 3PM prior to the day of delivery and also cancel within the same time limit to avoid a 25% cancellation fee. We are flexible when you can’t place your orders before the agreed time and so we try to accommodate your emergencies. Pay via cash, personal and corporate checks, and major credit cards. We also accept payment through corporate accounts where we have payment plans with you. You can place your orders online or via phone and the delivery fee will be determined by the distance. We deliver on time too. Our menus consist of all the food items everyone loves. We are known for our overstuffed sandwiches, overflowing plates of goodness, savory and sweet desserts, and unique beverages. Anything not in our menu that you want added to your event will be included. Tasty food is only memorable if it is filling. Our meals give great value for money as they are generously served. If you are looking for the ideal Passover catering, get in touch with us. Great food and lots of it!! Amazing bagels made by friendly staff! Have Questions About Passover Catering?